This is not a brag post. I am not here to enumerate the things I acquire or tell you how much money I have. 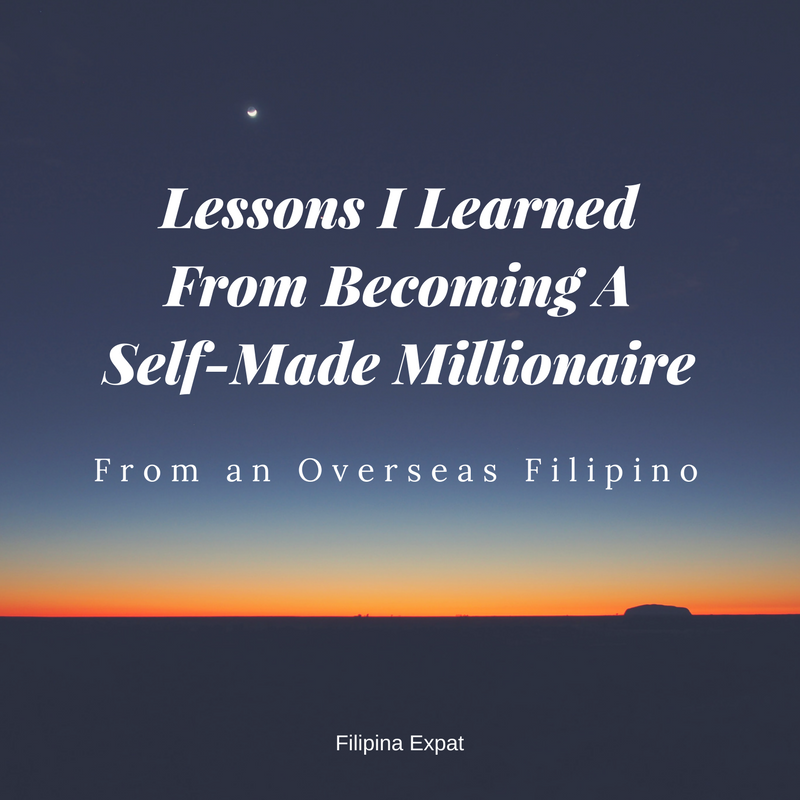 I am writing this post to let others know my way of thinking that helped me achieved my first million (in Philippine Pesos for now) in my early thirties. As someone who aspires to be rich (in all aspects of life), I devour reading positive and enlightening articles, how to get rich posts, success stories and anything about getting out of debt and poverty. I would have loved to read something similar to my post now when I was younger. Someone who I can relate to. Be inspired to achieve more in life. If all of us will be scared to tell people how we achieved our success for fear of being labelled as brag, then we’re not helping each other. If you are a regular reader, you know that I write posts about wealth and I would like to ‘normalize’ being wealthy. Having lots of money is not bad. It won’t make you evil. Your loved ones won’t get sick or die in exchange of you being wealthy. Your family won’t be ruined because of all the money you have. Money is just an object, a tool. How you make use of it is what will define you. Your character or values won’t change because of money. Having no money or lots of money just amplify who you are already. But money won’t change your core. It won’t. Most will say that they want money. But their actions and way of thinking state otherwise. They feel guilty having money. It’s awkward to talk about wealth. They always say they don’t have money (even if they do). Unless you change your poor mindset, there is no way you’ll get out of it. That’s the truth. I don’t actually think I’m wealthy (yet). We are still living on shared accommodation with Gibson’s siblings. We still eat on the same restaurants we usually dine 12 years ago (like Salt & Pepper and McDonalds). And we still buy clothes from Carrefour from time to time. I never really felt that I am millionaire. It just so happen that we have a business and we have money in the bank and several investments and a property. But most of my friends are like that too. They have savings, they have properties and side businesses as well. I guess the gauge of how we measure wealth differs at every stages of our life. This doesn’t bother me. People will judge you anyways. May you be poor, wealthy, thin, fat, jobless, workaholic, single, gay. There is always something to be said about you so I don’t actually care (or try not to). I was hesitant to write this post since I know not all people will be pleased. Either they will think I’m bragging OR my achievement is nothing compared to what they have achieved yet they don’t talk about it. But I reminded myself that sharing is caring. I know I can’t help everyone financially but if I can inspire 1 individual on how I achieved my little success in life by being more open and practical on my advice then I’ll be happy. That’s the reason I shared the SLIAN NAILS story. And it’s the same reason I always reply to each and everyone who asks me about the practicalities of setting up their own business in the Philippines. For me, nothing is a trade secret. I want to share what I know and how I do things if it will help them. If you know what you are doing is good for you, then do it. Don’t be afraid to be judged. I’ve been there and I surpassed it. I know several people who had bigger loans than what I had and were ready to give up then yet they surpassed it too. It’s possible to get out of it. Trust me. It just requires discipline, practical actions, and belief that it’s just a stage and you’ll finish your loans and debts in no time. You know that it’s not the end of the world, right? Read my post on how you can get out of debt. Once you started saving, you will want to save more. I think that’s why most rich people become richer. Once you see that your savings have grown to 10,000 your mind immediately releases some happy hormones. You would then want to increase your savings to 20k because you know you can do it. Then 50k, then 100k. Instead of buying a new gadget, you will now put the bonus you just received into your savings account. Same way that once you start to invest, your appetite for risk increases and you will start to diversify more. You become aware of the options available to increase your earning significantly. Achieving things boosts confidence and the belief that everything is possible. Use this feeling to achieve more rather than being scared or feeling guilty. You know how some religion will ask you to share 10% of your earnings to the church. Although I don’t agree with it, I believe that being charitable will bring good karma. I always here the lines “Oh! I would like to help if only I have money”. You don’t need to wait until you have money before you start sharing your blessings. Not to sound being saintly here but I have always been giving. It’s in my nature. Even when my I was still surviving on my meager salary and debts of my own, I always lend money to people (no one paid me back, that’s a different story) and give to those in need. I share not because I need to but because I want to. I never expect anything in return. Gibson and I started being World Vision sponsor in 2008. We didn’t wait to be rich. Start doing your philanthropy mission now. It doesn’t matter if you’re giving 20 or 200 or 20,000. See how giving to others makes a difference in your life. You feel abundant. Believe me, it will be magical and the feeling is priceless. Once you started having money, you will realize that it’s easier to have more of it. It’s quite true that once you have your first million, getting the next one is easier. If you maintain the positivity, the guts, the discipline and determination when you were just starting, you will realize that it’s easy to make more money. You will build confidence. You can take risks because you have the safety net (in terms of savings). Sure that money won’t grow in trees but you’ll be surprised how it starts to come from everywhere. You might receive a bonus or get promoted. Got a new job or have a new client. Your company might give additional benefits. You will be more receptive on receiving because you don’t repel the idea of having more money. You can have lots of cash and you will still be you. We can change and improve, why not, but we don’t have to act or behave differently if we don’t want to. Funny how I used to think that once I become rich then I will start wearing everyday clothes from Zara or I won’t mind buying bags from LV. Now that I think I can afford it, I don’t feel like buying clothes from Zara or buying bags from Louis Vuitton. It doesn’t excite me. Nowadays, I always tell Gibson that if money is not an issue, he should buy me a Cartier or Rolex. For sure when the time comes that we can afford it, I won’t really buy it. So you see, you can be the type of rich that you want to be. You don’t need to be ostentatious if you don’t want to. But you can splash it out if you feel like it. You can be rich and hippy. Rich and still enjoy midnight sales. I always hear people tell me and Gibson that we are lucky. We have high-paying jobs, we have business, we’re successful, etc. etc. It’s like telling us that we achieved what we have right now just of sheer luck. But you know what I think is the greatest difference between rich and poor? I have always said, time and time again, that what you think is possible will definitely become your reality. If you can perceive it then you can achieve it. Believe this quote and it will be absolutely life changing. Day dream. Plan your future. Write your goals. List down your wants. Don’t feel guilty nor scared on stating what your heart desires. No one will judge. You are safe. If there’s one thing I noticed nowadays is most of us are start to become financially literate. More people understands the value of saving, of investing, of creating a better financial future. Unlike our parents’s generation wherein they consider their children as investments hence no planning of retirement has ever been made, Gen X and Y are more financially knowledgeable which is a very good thing. But more than being financially literate, I want all Filipinos, especially Overseas Filipinos, to become whatever rich they want to be. I want everyone to achieve their goal and won’t need to sacrifice being away with their loved ones just to survive. The dream is for Overseas Filipinos to work abroad because they want to and not because they need to.